← I fought the law, and the law lost. It isn’t news to officers anywhere that interrogating a child without a parent present often leads to a false confession, especially if the child is emotionally or developmentally challenged. Young Bryce Vandergrift is incarcerated for a homicide that the dying victim told an officer was committed by another child … his son. 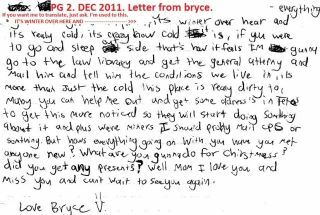 With Bryce’s distraught mother’s permission, I’m sharing his Holiday greeting to her, along with a condensed version based on work with the developmentally disabled decades ago … Because his mother lives in Florida, Bryce reminds her that it’s winter in Texas, where he’s incarcerated. He wants to write to authorities and get them to provide heat and clean up the place for all the children, and wants his mother’s help in getting addresses that he can’t get from the facility’s law library. Like most wrongful convictions, Bryce’s was preventable. Interrogating minors without a parent present often leads to false confessions. When the child is mentally challenged, the odds of a false confession are off the charts. A false confession was similarly obtained from young Davontae Sanford in Detroit, again without a parent present. Like Bryce, Davontae is mentally challenged, and – again like Bryce – there was little reason, if any, to even consider Davontae a suspect. Since Davontae’s conviction, one of the actual shooters confessed to the quadruple homicide, naming his accomplice and clearing Davontae. While it isn’t news to officers that interrogating a child without a parent present often has disastrous results, it’s often news to the general public … at some point, the mainstream media is going to have to explain to Congress why they routinely chose to put the self-soiled reputations of public servants ahead of public safety. Treating even one child – innocent or guilty – like a forgotten popsicle in a filthy freezer is unacceptable – I can’t help but wonder if Davontae is as bone-chillingly cold in Michigan as Bryce is in Texas. Christy Clinton Phillip’s California conviction appears to be a carbon copy of Bryce and Davontae’s – a mentally challenged child, interrogated without a parent present, convicted on the basis of the resulting false confession. If you take the time to click the link below and sign the Change.org petition to help Christy, you’ll be helping Bryce and Davontae, too. This song on YouTube may help you make up your mind to sign. This entry was posted in Uncategorized and tagged Bryce, Christy Clinton Phillips, Davontae Sanford, False Confession, officer misconduct, wrongful conviction. Bookmark the permalink. 6 Responses to Bryce, Davontae and Christy … Bless the Beasts, Not the Children? Apologies are in order for the appearance of this post, too. Hopefully, the technical difficulties will be fixed soon. I am requesting your consideration to remove my post above as they are no longer active. We have closed several of our sites/blogs/wordpress/etc, and the petition is no longer available. Per the request of their author, removing prior 2011 and 2012 comments from this post, as well as my response(s) to them.